The sources behind most of the money raised by politicians and political groups are publicly disclosed. Candidates, parties and political action committees — including the super PACs that are allowed to accept unlimited amounts of money — all report the names of their donors to the Federal Election Commission on a regular basis. Or, to be technical, they regularly disclose the names of all their donors who each give more than $200. But when the source of political money isn’t known, that’s dark money. The two most common vehicles for dark money in politics are politically active nonprofits and corporate entities such as limited liability companies. Certain politically active nonprofits — notably those formed under sections 501©(4) and 501©(6) of the tax code — are generally not required to publicly disclose their donors. Meanwhile, when limited liability companies are formed in certain states, such as Delaware and Wyoming, they are essentially black boxes; the company’s name is basically the only thing known about them. These LLCs can be used to make political expenditures themselves or to donate to super PACs. The Supreme Court is the final arbiter of adjudication in this country, but that doesn’t mean that they will always issue their own rulings. What happened here is that the Supreme Court allowed a lower court’s ruling to stay in place. In 2015, the Federal Election Commission was deadlocked 3-3 on whether to investigate the dark money group, Crossroads GPS. In 2016, Citizens for Responsibility and Ethics in Washington (CREW) sued the FEC over it. 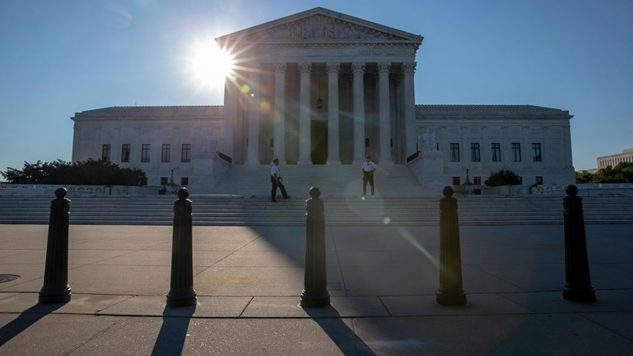 Last month, U.S. District Court Chief Judge Beryl A. Howell ruled for CREW and she gave the FEC 45 days to issue a new regulation that would require donor disclosure in accordance with the law. BuzzFeed News’s Chris Geidner explained the lower court’s ruling of this dispute between Crossroads GPS and CREW on Twitter four days ago (a “stay” is the act of temporarily stopping a judicial proceeding through the order of a court). CREW and Howell said that's wrong under the law, regardless of the rule, so the rule must go. Howell gave the FEC time to pass a new rule, which they didn't do, and the ruling was set to go into effect on Monday. In the interim, both the DC Circuit and District Court denied the stay applications filed in those courts — leaving SCOTUS as the only available outlet. The language in Roberts' stay order about "pending further order" suggests he views this as a temporary measure, put in place to keep Howell's ruling from going into effect until the full Supreme Court can decide how it wishes to resolve the stay application request. The only times I've generally seen such temp, one-justice stays are in death penalty cases from states where, absent a stay, the state will proceed with an execution even while a stay request is pending. In that instance, a single justice will issue a stay while SCOTUS considers. As Adam Serwer’s brilliant piece in The Atlantic about the history of the Supreme Court detailed, the Court has historically been opposed to rulings that harm private capital. A long-view of the Supreme Court’s decisions proves that it is committed to upholding America’s corporatocracy, while enabling white supremacist laws at the local level. The reason we highlight wildly important rulings like Brown v. Board of Education and Miranda v. Arizona is because they are the exception to the rule of the litany of decisions like Dred Scott v. Sandford (denied citizenship to African American slaves), Plessy v. Ferguson (upheld “separate but equal” segregation laws), Korematsu v. United States (upheld internment of Japanese Americans during WWII), and Citizens United v. Federal Election Commission (enabled corporations and unions to spend unlimited amounts in elections, helping to create the dark money groups this recent Supreme Court ruling strikes a blow to). While this latest decision is encouraging, the fact that it may be temporary is reason enough to remain somewhat cynical, especially since the Republicans are doing everything they can to ram Brett Kavanaugh on to the Supreme Court while hiding as much of his past as possible. Dark money is inherently anti-democratic, which is exactly why America’s oligarchs like it, and the Republican Party.